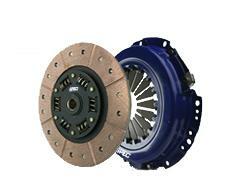 SPEC Clutch Kit - Stage 3 PLUS - Dezod Motorsports Inc - Home of the automotive performance enthusiast since 2002. I have this on a fbody, and love it. Its holding 800ft lb’s of torque right now, and I must say its easy to drive with that high of holding power. Easily holding over 300kw atw in my Eclipse. No slipping on hard launches. Pedal feel is a little more than stock but nowhere near as bad as the ACT clutches. A little bit of chatter and noise coming through the gearbox as expected. Takes some getting used to when trying to slip it on the street on slow take offs but then again you wont find a clutch like this your typical street car.